Cancer is a word I’ve known for a long time. I’ve heard the word used in the context of medical research. I’ve heard it uttered when it has come to affect family or friends or colleagues, or those of my family, friends, and colleagues. I’ve heard it spoken at many fundraising events, looking to find the cure. I’m familiar with its definition. The National Cancer Institute defines cancer as, “A term for diseases in which abnormal cells divide without control and can invade nearby tissues.” Yes, cancer is a word I’ve long known, but I remember the day I learned what it meant. I knew the word cancer, and I knew that its abnormal cell division affected my grandma, but from all that I could tell, that didn’t mean much when it came to the strong will of one Nancy Pokres. Although I had watched some of its effects take root over time, I hadn’t yet seen the bigger significance of what that all meant. 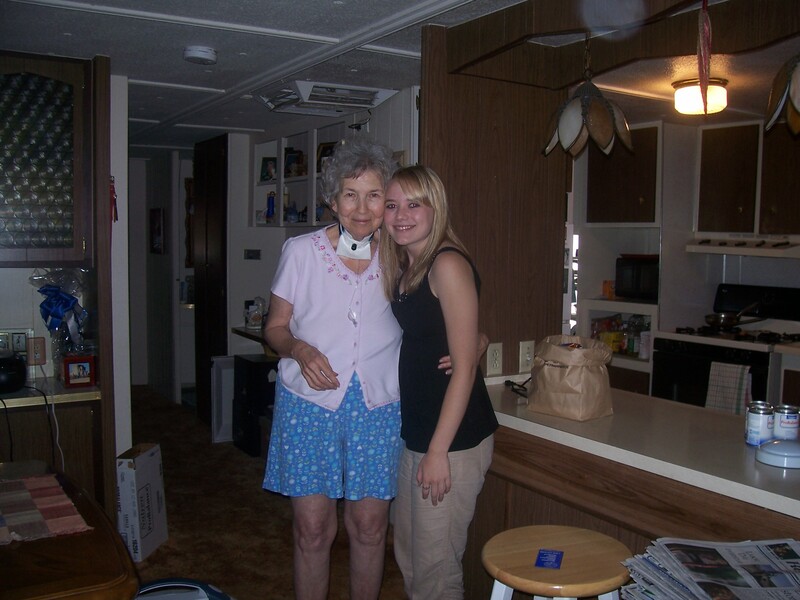 Then there was the day I took my grandma to one of her doctor appointments, and my entire understanding of the disease changed. As the nurse drew her blood, I looked over and found her in silent tears. Her tall, Amazon body scrunched in pain and her face quivered as she brought her tissue up to dab her cheeks. I’d never seen my grandma cry, and as I moved closer to put my arm around her shoulders and to just be there and love her, I also felt a certain sense of paralysis. This disease had brought my vision of strength to a breaking point. I felt the scary, uncertain, aching depth of what cancer meant. And I felt the hopeful, loving, tender breadth of what those moments battling cancer meant. Nancy Pokres passed away on July 31, 2012, and when she did, I promised her that I would do her life justice through the living of my own. That moment I saw her cry taught me to remember that we’re all here to help carry one another’s pain when that sensation becomes too much to bear alone. That memory drives me as I move forward to create a meaningful life. In her honor, I remember her whenever I travel, and think about how I would describe the place in the letters we used to exchange. I let my heart glow when I read great novels, knowing how much she appreciated good writing. I think of her when I work for social justice, knowing the fight is worth a long day. When I laugh with friends, dine with family, or take a quiet moment to myself, I remember my promise to her to do her life justice through the living of my own. In September, I plan to participate in the 2015 Ride to Conquer Cancer, which benefits Johns Hopkins Kimmel Cancer Center, Sibley Memorial Hospital, Suburban Hospital, and Howard County General Hospital. This ride is a physical challenge that will cover 150 miles over the course of two days. The ride is also a challenge to raise a significant amount of needed funds for cancer research and services. It’s a chance to keep working towards solutions to ease the pain I saw my grandmother experience, and that of so many others we all love who are bravely fighting cancer today. I have committed to raising $2,500 for this cause. I’ll need the support of friends, family, acquaintances, strangers, and everyone in between to make this happen. If you would like to ride with me in honor of someone you know, or if you’d like to help me honor my grandmother, please visit my fundraising page to donate today. Any donation amount helps. Little by little, we can make a big impact and live our lives in justice to all those we love. Thank you so much for your support! This one is for you, grandma.